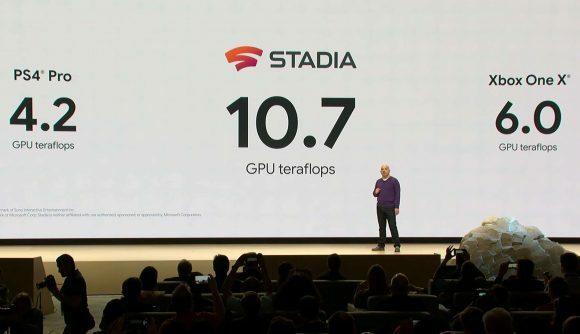 The reveal of Google Stadia last week was a potential sneak-peek of the future of gaming, where all our games are streamed, and we just have to worry about internet connections rather than better graphics cards. However, the main concern players have about any sort of game streaming service is input lag. Thank goodness there’s now a highly unscientific, slightly inaccurate, and moderately uninformative slow motion video to show us exactly what we need to be angry about. In the video, he simply paused the copy of Assassin’s Creed Odyssey running through Stadia and started moving the cursor from left to right. He then slowed down the video, which showed a noticeable lag between his movements and the actions on-screen. Ryan estimates the input lag is around ~166ms, or about 5 frames out of 30fps – which isn’t a really good way of estimating lag, but he admits it’s “unscientific”. You can check out the full video below, but we advise you keep the sound off unless you wish to be slightly annoyed. It’s a little bit concerning, but there are a number of points to note before you get out the pitchforks. Firstly, it’s an offscreen video rather than an accurate recording on the system itself. Secondly, this is all conjecture. Thirdly, this isn’t using the Stadia controller, just a very basic pad. And finally, Ryan doesn’t know if this is over LAN or internet. Perhaps more concerning is the claim that Assassin’s Creed Odyssey was running at 30fps, when one of the big selling points of Stadia is that it’s meant to be 1080p/60fps at least. Nevertheless, this was only a very early demo of Stadia, so there’s plenty of time for the tech to catch up. Unless there’s input lag, in which case it’ll be ~166ms behind.